We have 2 parties coming up for little boys turning 4. Mostly using bits from the scrap box. It's nice to find some time for 'personal' stitching. Lovely gifts! Great choice of fabrics. super cute! the little boys will love them! I just love the car fabric. I need to find a new feature fabric for boy presents. Ah the cushions look fab! I'm sure the boys will love them. these pillows are adorable...the colors everything is so pretty. Beautiful!!! You are too clever! Fabric combo's are fabulous. Lovely as always Andi. Thanks for sharing! Wow! They are wonderful - love the combination, design, everything! Those are very cute scrap creations! Great idea for a gift.I am sure the little boys will love them. What great pillows!! Who knew scraps could be so wonderful! Beautiful cushions and perfect for little boys! They are wonderful! Love the car fabric. Lucky boys they are. 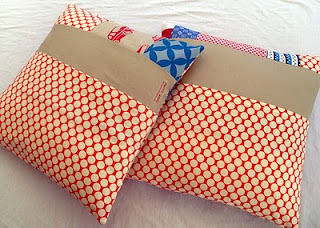 I make pillows a lot as gifts for the kids. Roan groaned the other day and asked if we couldn't just buy something. I like using fabric that has numbers so you can pop in the age. gorgeous andi! I stocked up on more of the re-released lotus but it's slightly more yellow to the original but still gorgeous! how perfect for boys! well done! Gorgeous, love the blues and reds. they are really lovely - fantastic fabrics! The cushions are great gifts and they look perfect for little boys. Gorgeous design and fabrics!! You have some mighty scrap box! You make it sound so effortless! They look incredible! Fabulous - I want one! great use of that fabric! Love them! they are so fun! the backs are lovely too! Oh, I love these! What great gifts! We just celebrated a birthday here and I wish my son had received one of these instead of some of the other stuff he got! These look fantastic Andi. Love the colours and pattern placement - great job! 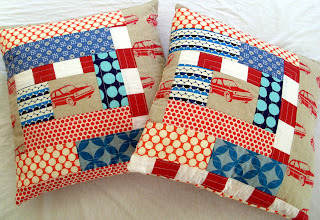 What amazing and fabulous cushions!! I need your advice please!! !